Designed by Rockwell International, the B-1B Lancer is a four-engine variable-sweep wing strategic bomber used by the U.S. Air Force. 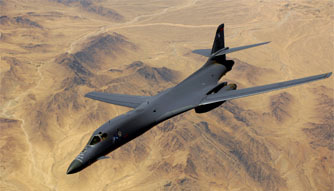 The B-1B was the primary nuclear bomber until the end of the Cold War and was converted to a conventional bomber in the 1990s. The B-1B can carry the largest payload of both guided and unguided weapons in the Air Force inventory and is capable of delivering bombs or conventional cruise missiles anywhere in the world from it’s U. S. bases. Its three internal weapons bays can accommodate up to 84 Mk-82 general purpose bombs or Mk-62 naval mines, 30 CBU-87/89 cluster munitions or CBU-97 Sensor Fused Weapons, and up to 24 GBU-31 JDAM GPS guided bombs or MK-84 general purpose bombs. The B-1B employs forward-looking radar and terrain-following radar and utilizes an extremely accurate GPS/Inertial Navigation System, Doppler radar and a radar altimeter to navigate accurately around the world without the ground-based navigation aids. The B-1B is currently the only active variable-sweep aircraft in the U.S. military. Forward wing settings are used for takeoff, landings, air refueling and in some high-altitude weapons employment scenarios while aft wing sweep settings are typically used during high subsonic and supersonic flight, enhancing the maneuverability in the low and high altitude scenarios. Maney Aircraft, Inc. has been part of the B-1B Lancer team since early in the production phase and helps keep the bomber operational, supplying many critical aircraft parts and ground support equipment using data supplied by Boeing under license. The B-1B is projected to remain in service until the 2030s and Maney Aircraft, Inc. will proudly provide full support as long as it is in operation.